“We have been waiting for today since September 18, 1998, when Dean John Montgomery appointed a nine-person committee, chaired by Professor Phil Lacy, to begin the design of a new law school building,” said Dean Rob Wilcox, beginning his speech at the dedication ceremony for the School of Law’s new home. While the building has been long in coming, in the end its arrival couldn’t have been timed more perfectly, coinciding with the 150th anniversary of the law school’s founding. 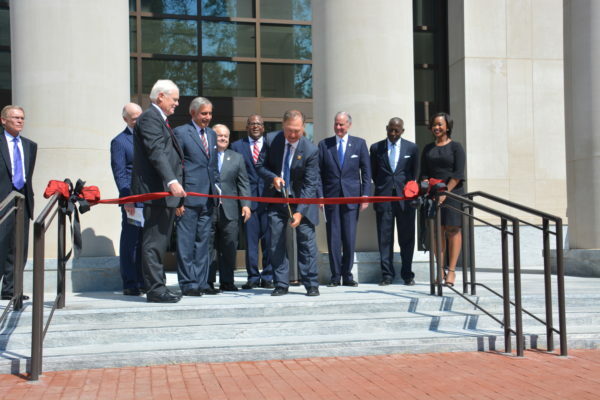 The ceremony was held on Thursday, Sept. 14, and the audience of more than 600 who came to celebrate the ribbon-cutting included alumni, university and community officials, and some of the most esteemed members of the state’s and nation’s legal community. Among the speakers were the Honorable Donald W. Beatty, ’79, chief justice of the South Carolina Supreme Court; William C. Hubbard, ’77, a university trustee and former president of the American Bar Association; Henry McMaster, ’73, governor of South Carolina; Stephen Benjamin, ’94, mayor of the City of Columbia; and President Pastides. its ability to link to the past, look to the present and connect to the world beyond. heights — thanks in no small part to the excellent education they will receive in this new state-of-the-art facility. Indeed, the new building marks a milestone in the law school’s history, a moment to which all alumni can point with pride, and a turning point for how legal education is taught in South Carolina now, and for the next 150 years.